In my determination to start writing regularly in one form or another I began a long typing session the other night, only to realise how loud my keyboard was. Probably not the best thing in the world to be typing away on late at night, and so I began a search for a complimentary keyboard for those lengthier sessions. Years ago, when I had a Mac ( a very long time ago and it's only happened once I swear), I grew to pretty much hate most things about it apart from the keyboard. I loved that thing, it was an absolute pleasure to type on. Alas, somewhere along the way it broke and was henceforth confined to the great keyboard kingdom in the sky. To cut a very long story short, I went hunting for a new Apple keyboard, retched at the price of that and well, most keyboards really (in fairness my meagre budget is easily offended). After a long and laborious hunt I finally decided on a cheap Apple look-a-like that, given the price, I didn't mind taking a gamble on. That's when I stumbled upon the Jelly Comb wireless keyboard priced at £18.99 on Amazon (model IWG-46 to be precise). It arrived today, so this isn't exactly a comprehensive review but I can give some quick initial impressions. The keyboard is a full size one but despite this it's a very slim profile and compared to my old keyboard is almost half the size. Not surprisingly in this price range it's an all plastic construction with scissor switch keys. The keys probably won't last forever given the price but they are very quiet and adequately spaced, for me at least (I'm a touch typist with female not too large fingers). The key spacing was one thing I was a little worried about so I'm glad to report that it's fine. On the keys not lasting forever point, I should note that the F7 key arrived already faded, so it's likely a good bet that will happen to the rest of them too eventually. It's a 2.4GHz keyboard and so was a simple plug in the usb dongle and go type affair with no need to install any additional drivers. I've only tested this under Windows 10 so far, but I'll update the post when I've had a chance to test under Linux. There have been no problems at all under Windows as yet – no keyboard lag or anything of that nature. It's powered via two AAA batteries (not included) – I'm using rechargeables. According to the product description “to save power, the keyboard will enter sleep mode if it's not used for over 10 minutes. Just press any keys to wake it up.”. You can also just turn the keyboard off via the power switch on the back if you know you won't be using it for a while. All in all, if I only get 12 months of service out of this I'll be happy (note the Amazon page does state an 18 month warranty alongside a 30 day money back offer). It's comfortable to type on, it's small, it looks ok and the price is definitely right. As to my old keyboard, that would be my old faithful Logitech G15. 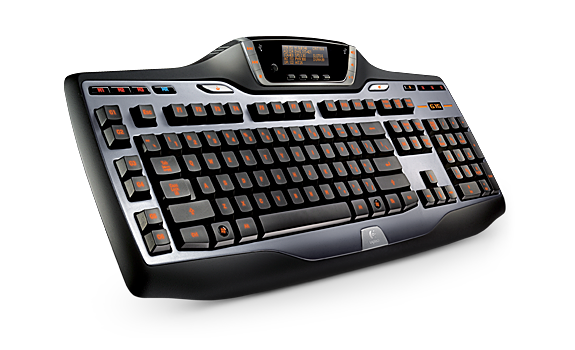 Note the image isn't my personally owned keyboard, I was lazy and am using a stock image from the Logitech site. My trusty old G15 is now around 12, possibly 13 years old. At the time of purchase it was quite pricey but given the amount of years I've had it I really can't complain at its value. It's still going strong now, there's absolutely nothing wrong with it other than it is a touch on the loud side for typing anything other than quick chat messages. It's been cleaned I don't know how many times and there's not a hint of faded keys or surface in sight and it performs just as well as the day I got it. Of course, I'd love a mechanical keyboard but one of those has sadly been outside of my budget for some time and I don't see that changing any time soon. Until then, my G15 will remain in service alongside my new Jelly Comb for writing sessions.